Editor’s note: This is a guest post by chwhite, taken from the forum thread of the same name. See also Building a +Actions/+Cards Engine. The obvious best Village; I think it’s safe to say everyone agrees with this one. It’s just such a good value! 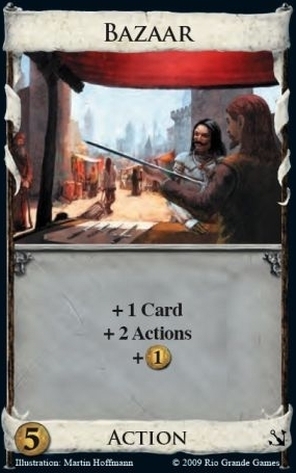 $1 this turn and next makes it almost as good at giving cash as Silver, and then it gives you two extra actions to boot, which is more than any other card in the game! To give you a sense of just how good it is for its price, take a look at Caravan, which is supposed to be one of the best $4s. Caravan is nothing the turn you play it, and a Lab the next turn. Fishing Village is +$1, +Action, -Card this turn and (as Rinkworks pointed out) a Bazaar the next- and it’s cheaper! Basically, if you’re buying terminals at all (and not going Bank), there’s virtually no reason to buy Silver ahead of this, ever. The one supposed downside to FV is the lack of +Card the turn you play it, which it shares with Festival and University. So Library/Watchtower/Menagerie become more powerful, and +Card in general is necessary for chaining. It’s better than Festival and University in the absence of those enablers, though, because a) it’s cheap and b) the Duration effect mitigates that downside. 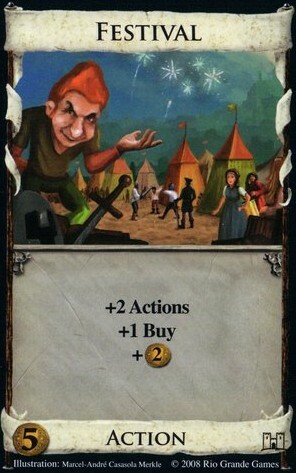 Another big point in Fishing Village’s favor, one which it only shares with the powerful but expensive Bazaar and Festival, is that it gives cash along with actions, which allows you the crucial ability to bake buying power into your engine, and not muck around as much with inert Treasure cards. This is actually really important when setting up many engines, and FV does it for two less than its competition. Hamlet and FV are the two Villages which deserve spots on the Top 5 lists (well, maybe NV does just because there are so few $2s); Hamlet is probably the second-best $2. The key to Hamlet’s power is its extreme flexibility and cheapness. It’s not great in trimmed decks where discarding is painful, but usually you can dump your Coppers and Estates easily to get the effects you need, and there’s virtually never a downside to having more Hamlets. And it works wonders with Library/Watchtower/Menagerie, like many of the Villages here in fact. Like Tier 1, Tier 2 cards are excellent engine cards and are worth buying in most situations. But while the Tier 1 cards are cheap enough to basically always be worth buying even when their effects aren’t super crucial, the three Tier 2 cards are expensive- they’re all $5, and they have to fight against other $5 cards to get bought. So they don’t make any Best Of lists. But they’re usually good to have around, and their power is hard to ignore. I’ve explained why I like Bazaar so much in the post that inspired this thread. 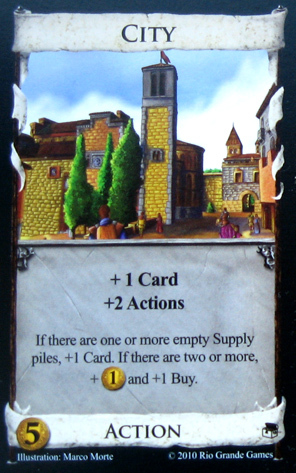 Bazaar is probably the best Village for when +Card is scarce, and/or when you have sources of +Buy. Festival (which is my favorite card in the game) is its mirror image: it desperately needs good +Card in order to be anything more than a super-Woodcutter, but it is the best Village at giving +Coin and +Buy. Obviously the Library/Watchtower/Menagerie trio is great, but Festivals play particularly well with Minion and Tactician as well. In Festival/Minion games, I love to spend my first $5 on a Festival, to take advantage of the Buy as fast as I can. This will often pay off in double Minion turns down the line, or lots of extra Lighthouses, or whatnot. I think Festivals can work as an engine with +3 Card effects, despite the lack of Card- basically, think of them as Worker’s Villages that always draw Silver, not bad. But if there’s no +3 Card, or there’s lots of other Buy, Bazaar is the right choice. If pressed, I would probably rank Bazaar a hair above Festival, but really it’s too close to call. Bazaar is good in a wider variety of situations, but Festival is more powerful when it’s good, and is at least somewhat useful most of the time as well. In games with both Bazaar and Festival, and not with specific Festival-bait cards, I think the right answer is to buy one or two Festivals (for the Buy and cash) and Bazaars the rest of the way (for the Card). Unlike Bazaar (always good to have, rarely spectacular), Cities are often quite bad to have, but when they’re good they’re so good. In games where piles are liable to run out, Cities are incredibly strong- having a stack of Level 2 Cities is about as good a deck full of frickin’ Trusty Steeds; in games where the first pile likely to run out is the Provinces, the City trap will just kill you. 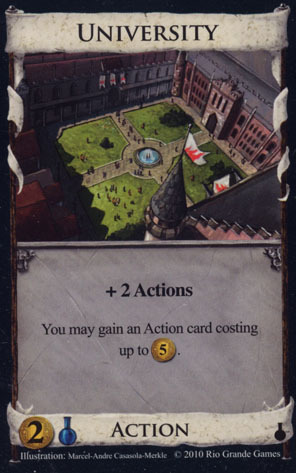 The best situation for Cities are setups that allow you to gain them while still boosting your buying power (University, Horn of Plenty), or Curse games. Games with spammable stacks are good too. Games with good enablers for fast Big Money strategies (say Vault, Hoard, Masquerade) are good reason to avoid Cities entirely.I am generally much more wary of using Cities to enable most engines than I am of using Bazaars or even plain Villages. However, in setups where piles are likely to run out with a decent amount of game left, the Cities become engines themselves. There isn’t really any unifying theme to the Tier 3 cards. 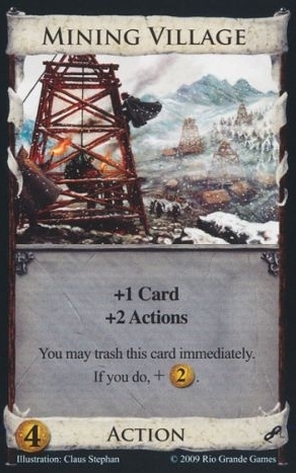 Most of them fall into the “sorta like vanilla Village but a little better” category, but there’s one exception, a card that’s sometimes much better and sometimes much worse. Probably the best Village-plus, IMO, since it’s guaranteed to draw a useful card. It’s best in situations where your deck has a lot of junk to sift through, and/or when you can get rid of those Coppers. An incredible (and incredibly obvious) counter to Rabble. Definitely one of the better combo-enablers, especially when paired with weaker +Card effects. Mining Village is the best Village to have when you don’t need Villages, and one of the worst to have when you do need them. The true power of Mining Village is not that it efficiently enables action chains (it’s one of the worst Villages for that), but that you can open with it and trash it quick for a Turn 3 Gold. It’ll chain if it has to (and if it does, its endgame potential for “cashing in” can’t be ignored), but the reason it’s this high is that it’s one of the very few Villages worth buying even if you don’t want to chain actions. 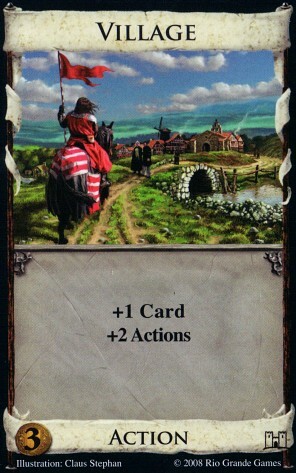 This is obviously the one Tier 3 card which isn’t just a Village-plus. Rather, it’s a Festival variant which is potentially much more powerful but at the expense of being harder to get and somewhat inflexible. Similar upside (great w/Library/Watchtower; get lotsa good cards) and similar downside (lack of +Card can hurt). Worth grabbing a few if there are Minions or Torturers or Cities to rush, but it forces you to open Potion and it’s far less useful than Festival once it’s time to go green. Much like City (for which it is one of the best enablers), its upside is tremendous but it gets docked a few ranks due to the fact it is often just an expensive distraction. Is the extra $1 worth just adding a +Buy? Usually. You often will buy a regular Village for $4, and +Buy is important to most engine decks. That’s the big reason I rank Festival so highly. But Worker’s Village is kinda low-ish because it’s actually a fairly poor source of +Buy. Festival gives you guaranteed money to spend on said Buy; WV merely replaces itself and adds an Action and Buy to the queue. (Of course, there are setups where the +Card is better than +2 Coin, but not usually IMO.) It’s excellent for enabling Peddlers, Conspirators, and other cheap cantrips, but unlike the Villages above it, it is merely an enabler. This is the lowest tier of Villages. 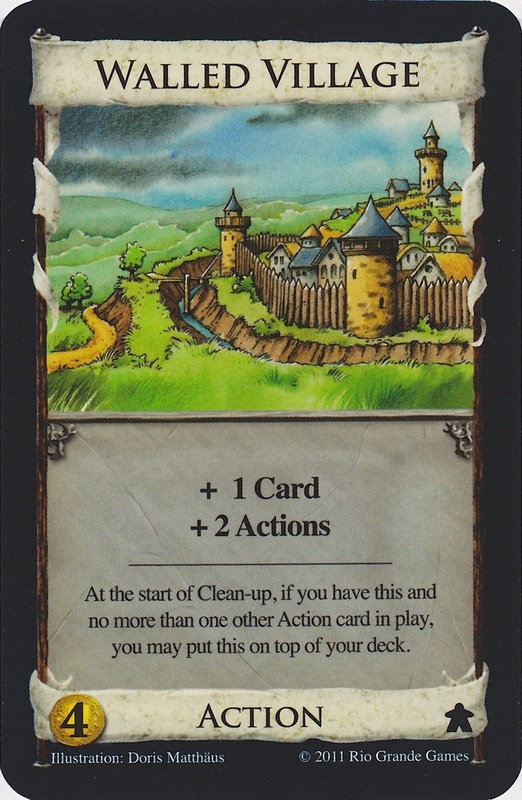 I thought about making a Tier 5, but the fact is that none of the Villages we’ve seen so far are actually bad cards; there are no Villages I’d put on any “worst of” lists, not even Walled Village. But these are the worst of the bunch, as they tend to provide few or uncertain benefits beyond their Village effect. If you don’t have a specific engine in mind, these cards are usually skippable. Wheeee. The original! There aren’t many situations where plain Village is the best one for the particular engine, but it’s cheaper than the more expensive variants and sometimes you don’t need their bonuses. Vanilla Village is still an important card, Village Idiots notwithstanding. When I first saw NV, I thought it sucked. Then I realized you could buy a bunch and save up for mega-turns, and I started buying NV all the time. But it’s fallen in my estimation a lot recently, and now I think it doesn’t just “look worse” than Village, but usually it is worse. If you don’t have a lot of NVs, the mat becomes risky; if you have to draw it when there’s only one or two cards on there, or it makes you stow away one of your good cards before you wanted to draw the mat, the NV is providing serious card *dis*advantage. You need to mass buy them for NV to be effective, and there’s a lot of opportunity cost in that. NV is very strong for certain megaturn strategies, of course. But if you don’t have a specific plan for it, don’t buy it. There are so few $2 cards that I might actually consider it a top 5 $2 card despite its low rank, but I think I agree with guided that it belongs at #6. Not the worst! But close to it. WV’s benefit is usually not worth the extra $1- in particular, it plays very poorly with cantrips; it requires a deck that needs *terminals* to actually be worth it. It’s theoretically nice with cards that trash themselves (Island, Embargo, etc.) but I think WV’s best use is with Torturer- it lets you buy fewer villages than would usually be necessary to get the first double-Torturer hit, in fact one is sufficient for much longer than would normally be necessary. In general WV is good in decks with a few strong terminals, and weak in longer chains. Bringing up the rear, Shanty Town is the closest a Village comes to deserving a spot on any Worst list, though I don’t think even Shanty Town would quite fit. The problem is that Shanty Town is uniquely horrible at building many engines: if you have Actions, it doesn’t give you Card, and if it gives you Card, that means you’re unlikely to use both Actions. And it is the worst card to rely on multiples of: extreme case, compare a hand of five Shanty Towns to a hand of five Villages. This is not to say Shanty Town is useless! One or two Shanty Towns can often be a good buy early in an Action-light deck, to use as a pseudo-Lab. And it plays well with non-terminals: clear out the non-terminals, and play Shanty Town to draw two. But it is pretty much the worst Village if you have to buy multiples, and it is also the worst Village at enabling the play of multiple terminals, which is the whole point of villages after all. This entry was posted in Guest Articles, Rankings. Bookmark the permalink. One thing I mentioned in the comments but forgot to include here: Cities are much better in multiplayer, where it’s much more likely that a pile will run out. With 3p or more, they’re a Tier 1 village for sure, ahead of Bazaar and Festival; maybe even Hamlet. This definitely raises the probability that Cities will be useful, and I agree this makes them a much better card in general. However, it’s probably also worth noting that no one player is likely to get more than 4 or 5 Cities in that situation, unless one or more of his opponents neglects to buy them. So even if your gameplan is “There’s going to be a race for Cities, and I will win it,” you should anticipate that the resulting City engine won’t be the most spectacular one you’ve ever seen. It’s true that you can’t count on getting a lot of Cities in a 3p or 4p game, but even if you only get a few, they’re still very powerful once *they* run out, so you almost need to buy them just as a defensive move. Bazaar is quite a misnomer in this game as a Bazaar is a Market and as such should offer 1$ and 1 buy. Wow, just like a real university! Does this make it the most lifelike of the cards? 2) They’re a lot more likely to “miss the shuffle” than non-duration cards. 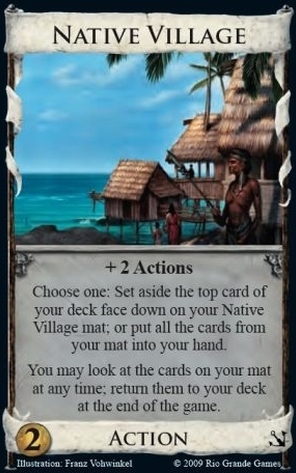 A fishing village bought in your first two turns generally has a 7/12 chance of not making it into third pass through your deck, while a silver has only a 2/12 chance. This is somewhat subtle, but going FV+FV can slightly weaken your early game buying power. 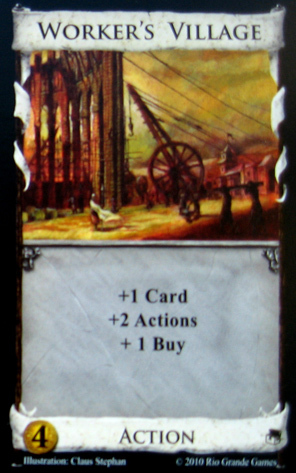 1) It’s true that any given Fishing Village can only be played every other turn at most, but does that matter? 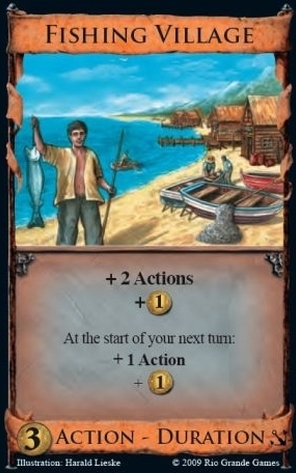 Fishing Village gives you approximately the same benefit the turn after you play it as the turn you play it (and exactly the same benefit if you’re drawing your whole deck anyway). So once you reach that stage, playing a Fishing Village every other turn has the same effect as playing a Bazaar every turn. No? I’m not so concerned about your point #1: if you’re drawing your whole deck anyway, that means FV’s lack of +Card is immaterial, and you should have (or be quickly amassing) cards which provide much more buy power than the FV anyway. Your point #2 is well made, and I agree that FV/FV is a mediocre opening. Fair enough, I suppose point #1 is more about durations in general and perhaps not so important with FV. However, I believe it’s the a lot more important when looking at the distinction between Lab and Caravan for example. It’s a lot easier to start drawing your whole deck with labs than caravans for this reason (and somewhat drawback 2 as well). I couldn’t disagree more with the points made in this article. I feel as if you’re writing it from the eyes of a new player that likes to spam actions rather than creating the most efficient province buying deck. All of the stuff about FV’s value is very true, but there are PLENTY of times when you want a silver instead of a FV. Namely, when you’re trying to get to 5$ (or potion + 3) more consistently. And how about the majority of games in dominon when a large drawing chain is not possible or necessary, silver is often simply better. That being said, it still might be the best village on average. Shanty Town can definitely be one of the best villages (especially considering its a 3-cost card!). Again, in games where you are not clogging you deck with terminal actions, this card is crazy good. You just have to play to its strength because its strength is monstrous. I realize these cards are not easily ranked, and you had to make some decisions here, but you should really rank/ tier these in accordance with how likely they are to be an integral part of the most efficient province buying engine in a given game…not just how good they are at dealing with a ridiculous amount of mis-managed terminal actions. If the most efficient Province-buying deck doesn’t involve terminal actions, then every Village is equally bad, so that case shouldn’t affect the rankings. 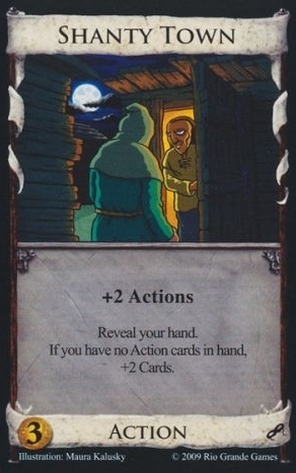 The exceptions are perhaps Shanty Town and City, but even in those cases the cards aren’t as effective as you generally want them; Shanty Town is only consistently “monstrous” when you have exactly one of them in a deck with no terminals, and both cards usually max out at being a Laboratory. I kind of feel like this is another one of those “how often is it useful” versus “how good can it be” situations; Walled Village and Village are at least a little bit useful in many set-ups, whereas Shanty Town is often totally useless but sometimes great. 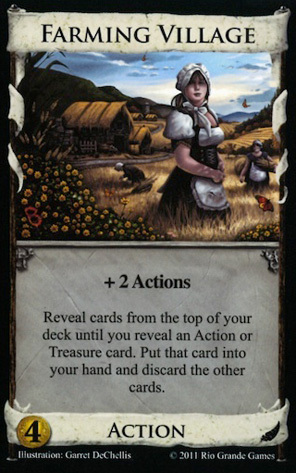 The three Villages which give +Buy (Festival, Hamlet, WV) can all at least be theoretically useful in no-terminal decks, as well. Maybe even Bazaar in certain, ahem, bizarre cases, though it becomes merely an expensive Peddler. I recognize the case where Shanty Town is very strong as a cheap Lab- I said so in the article! But there are two problems: First, in that case its Village effect is totally useless, so I think it’s fair to call Shanty Town the single worst source of Village-effect at least. Also, one Shanty Town is nice as a Lab but as soon as you buy a second Shanty Town it becomes unreliable: two STs in one hand is as good as nothing, three is worse than nothing. This means you can’t build any sort of Shanty Tow-powered engine, the best you can do in that situation is buy one or two for a little “pop”. This is fine and dandy if you add Caravans, Labs, etc. But Shanty Town + Big Money is really no great shakes: you get the same benefit from Moat in that case. Right; I was specifically talking about the case where you don’t have any terminals in your deck at all, which is good for Shanty Town because that means you’re playing it for the +2 Cards, like a Lab. In that case, five cards three actions is exactly the same as five cards one action. Unless you have a Diadem, I guess. I mostly consider Shanty Town as a soft counter to handsize reducing attacks (in particular Ghost Ship) and a cheap Lab in a cantrip deck, as opposed to a traditional village. I suppose with Cornucopia discard effects it could be useful but rarely would you want to discard actions. In order for Shanty Town to truly shine there needs to be more cards which allow you to rearrange your hand with the top cards of your deck. Right now Secret Chamber/Ghost Ship attacks can do it but both are unreliable. Lingo question: What is meant by “cantrip”? It’s from magic. It means a card with +1 card, +1 action. You play them for a side effect, and you don’t need to worry about your hand shrinking or losing actions. How is Masquerade an enabler for fast Big Money strategies? Well, even if you ignore the passing to other players part, you still have “draw two cards, you may trash one if you want.” Most of the time, Masquerade would be just as good even if it didn’t pass cards. This compares favorably with Smithy, actually: Smithy draws one more card, but with Masquerade you”re *also* getting rid of your junk (estates and coppers) at the same time. So it ends up faster. And since you don’t want to draw Actions dead, using Masquerade to thin your deck/cycle/increase your handsize goes well with a Treasure-heavy strategy. Two players going Masquerade/ Big Money can empty the Provinces in twelve turns. That’s *fast*. Seems to me that some of that is luck: ‘Winder’s second reshuffle netted him a gold and a silver, whereas your second reshuffle was masquerade/silver (or silver/silver, had you gone with one masquerade). That seems like a pretty big advantage to me. Your Masquerades collided twice, turn 4 and turn 11, but it doesn’t look like either of those collisions really hurt you in terms of buying power on those turns. Although, this seems like an easy enough question to answer using Geronimoo’s simulator, if anyone is feeling enterprising. As a new player I find it challenging to read articles where it’s assumed the reader knows the text on each card. I’m familiar with some cards and not familiar with others. Am I alone on this? You’re not alone, but http://dominion.diehrstraits.com/?set=All&f=list has a list of all the cards. Guiltiness vs Laziness, which will win? Efficiency and simplicity will win. Maybe a different point of view would be more appropriate. I think it would be worthwhile if links were integrated into posts allowing the reader to either hover over a card name to reveal the card’s contents or to click the link and go directly to the card. I can think of many benefits to this. 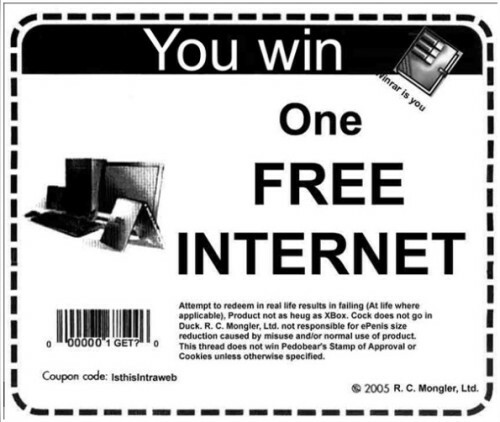 It enriches the quality of the post when you provide reference material for one. It might be an idea to just put in brackets after the first mention of a card in in article which expansion it comes from (e.g. “Fishing Village (Seaside)- The obvious best Village…”). That way, people who do not know can simply look it up on the card lists on this site. However, I would stop reading articles on the site the moment they became littered with “Fishing Village (Action – Duration $3 +2 Actions, +$1. At the start of your next turn: +1 Action; +$1.)”. When I read an article I want to just be able to read it and not have it broken up by unnecessary text which is already available elsewhere on the site and should really already be known by anyone wanting to study the strategy of the game in even a little bit of depth. You can’t really say, “hey, this game’s got a good Gardens strategy and I know that because I read an article about Gardens… wait a second what does Gardens do?”. It doesn’t really work like that. In the beginning, is it supposed to say that Fishing Village give you *three* actions, not two? Since it says that’s “more than any other card in the game,” so two doesn’t make sense. It’s all relative. The article actually says “two extra actions”. If you think of every card you play during the action phase as how it affects your “available” actions then Remodel “uses it up”, Cellar “restores” the action, and Festival leaves you with an “extra” action. Fishing Village gives you an extra one this turn, as well as next turn. This site has basically died. Sigh. There’s at least two more to add to the article at this time. Inn – tier 2. Fortress – tier 4. I’m arbitrarily deciding where to put each just to spur conversation. There’s also Bandit Camp, Wandering Minstrel, Crossroads, Border Village, and Squire. Madman and Necropolis might deserve a mention too. I might have missed some. The ones you name are tough because they’re so dependent on their non-Village-related abilities; more so than most of this list. 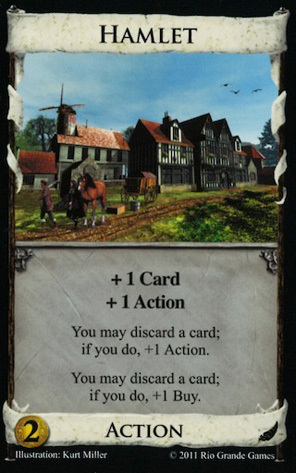 You might buy Inn (or Border Village) only to get the on-gain effects and Apprentice them later, not caring much about the +Actions. Fortress is strictly worse than Walled Village in the wrong Kingdom. But when combined with a card like Upgrade, it can be as good as a University with +1 Card. (Well, I guess it’s arguable which card gets the credit as the “University” here). It can also provide a nasty counter to trashing attacks. I’d put it in tier 3.